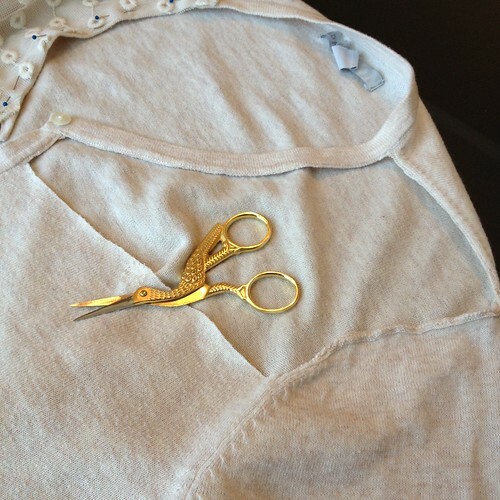 Over the last week, I've taken care of those half-dozen clothes swap garments that only needed a little tweaking. Let's start with the simplest and work our way up, shall we? 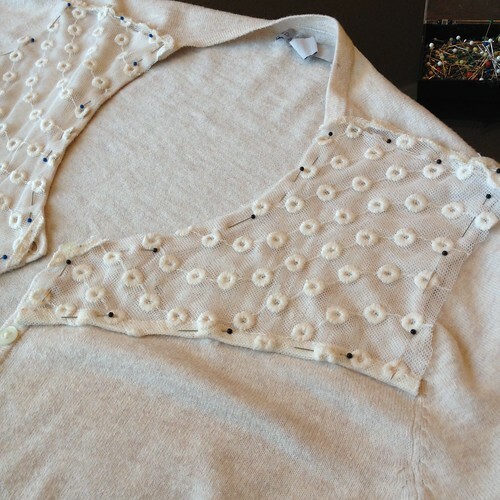 First, we had this grey patterned tank top, with a fabulous crocheted yoke and a rather unfortunate elasticated waistline. 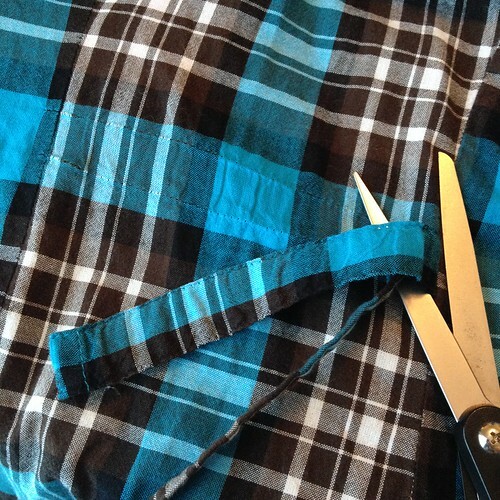 Since I'm not sewing for two, something needed to be done about that. The easiest way to go from unflattering to flowy? A pair of scissors! 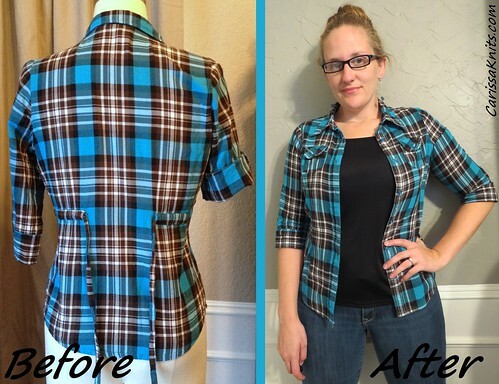 Then there was this plaid shirt that doesn't quite fit me. I'm thinking it must be a juniors' large. 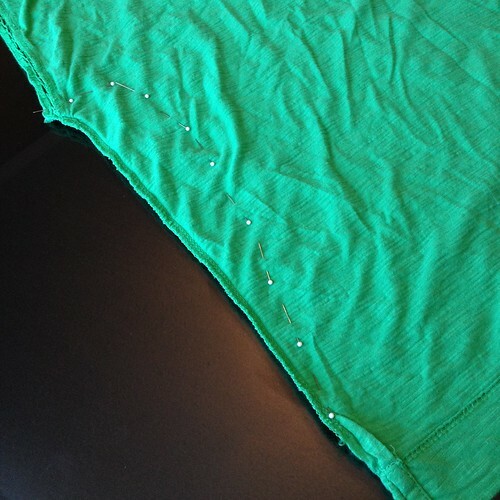 ...so I seam ripped them off the back panel and snipped them as close to the side seams as possible. What was Ralph Lauren thinking with this boxy tee? Seriously, it's almost exactly a square. I took in the sides under the arms, flaring back out for my hips. Just two little seams and we're back in business! 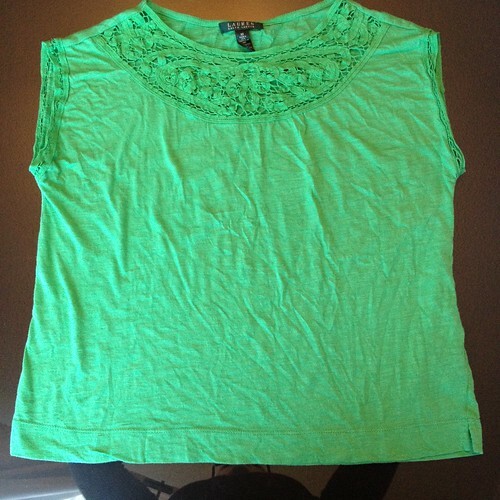 This tee looks great as is, right? Look closer. Yep, there's a grease stain right on the belly. 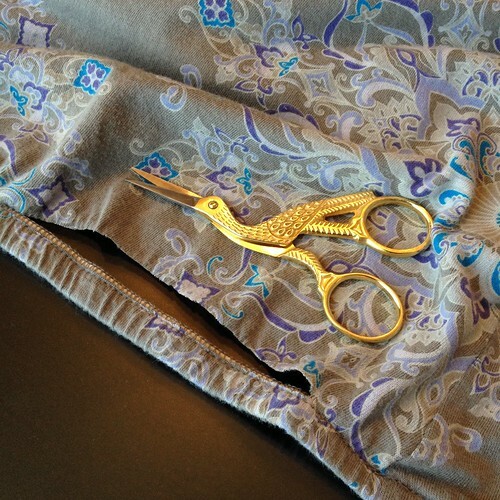 I wasn't crazy about the fluttery sleeves, so I snipped them off as close to the seam as possible. I pinned it in place over the stain. 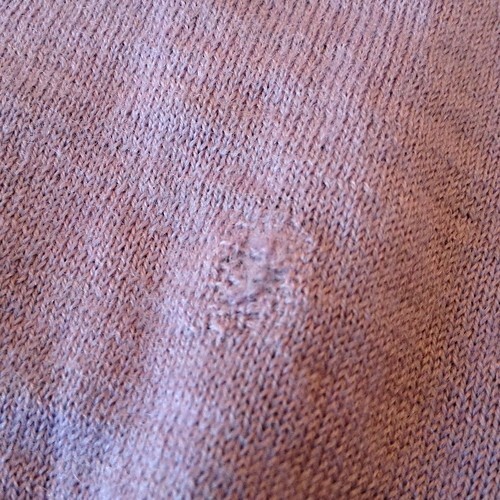 Then I stitched around the edges twice. 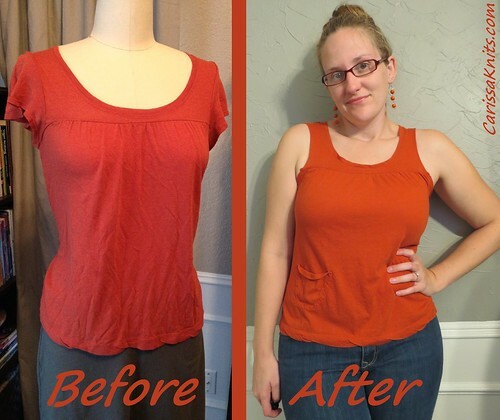 No more sleeves and no more stain! 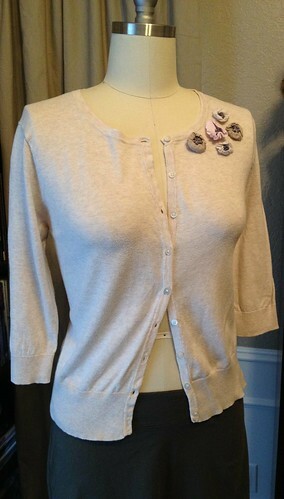 This cozy wool cardigan was fantastic, except for the holes in one elbow and at the bottom of the back. 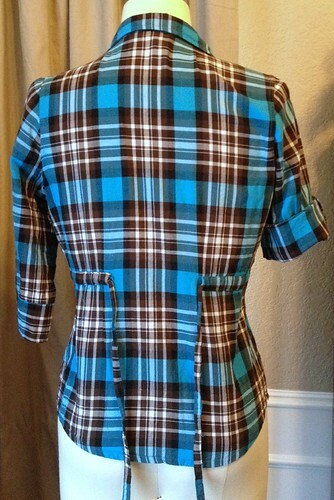 At first, I thought I might add some decorative elbow patches (hence the permanent marker oval in the pic below), but I decided to just shorten the sleeves instead. I cut out the damaged section. 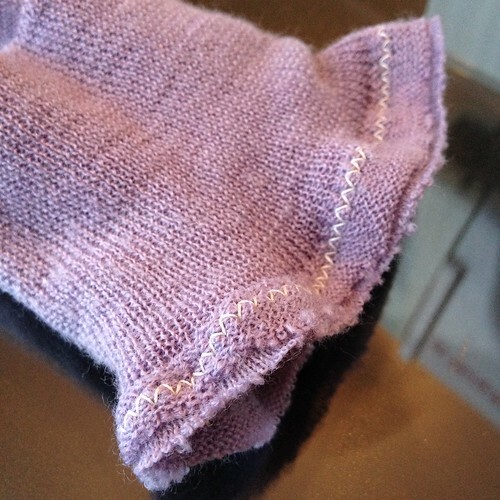 I put the inside-out cuff around the right-side-out sleeve and sewed them together with a zig-zag stitch for stretchiness. 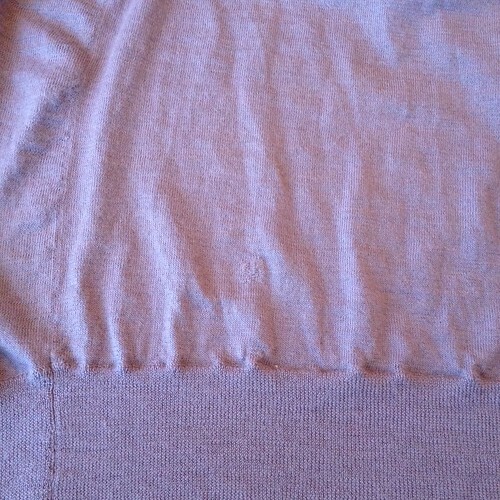 Then I trimmed the excess fabric as close to the stitches as possible without snipping them. 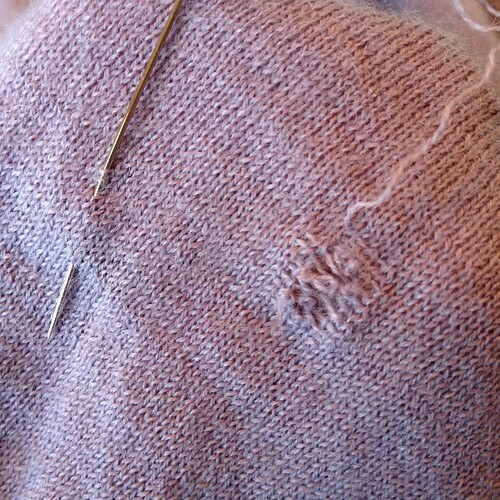 And of course, I repeated the process on the other sleeve. 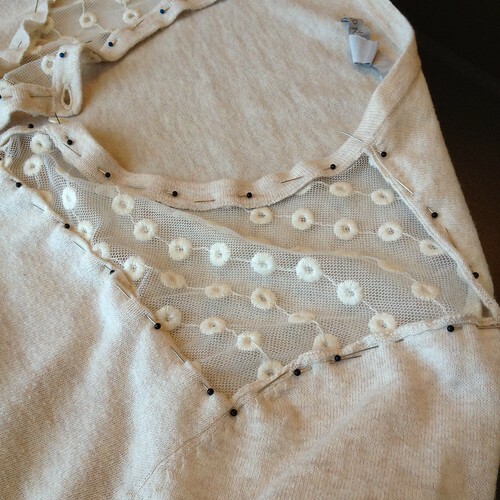 I decided to repair the small hole in the back, rather than trying to cut it out or cover it up. 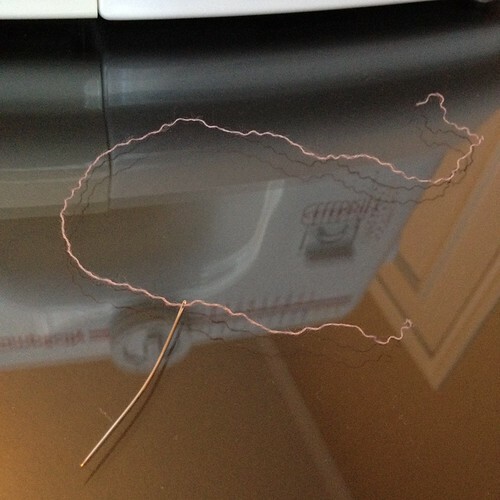 From one of the sleeve remnants, I unraveled a bit of yarn until I got a piece long enough. When moistened, it measured about 12 inches. I threaded it onto my sewing needle. The hole was pretty small, so unless you know to look for it, it's pretty hard to spot. From rags to revitalized in less than 30 minutes! And finally, my favorite. 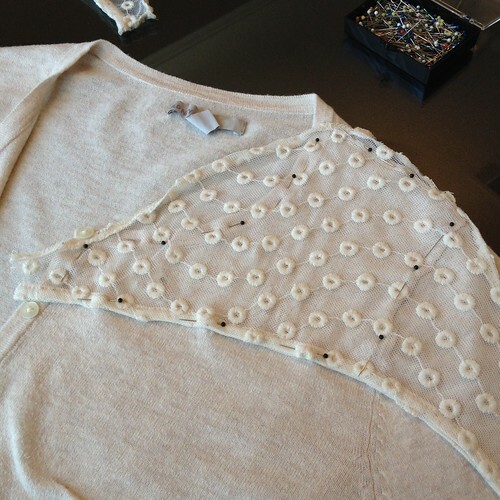 The embellishments on this cardigan weren't really my cup-o-tea, and the hole underneath even less so. 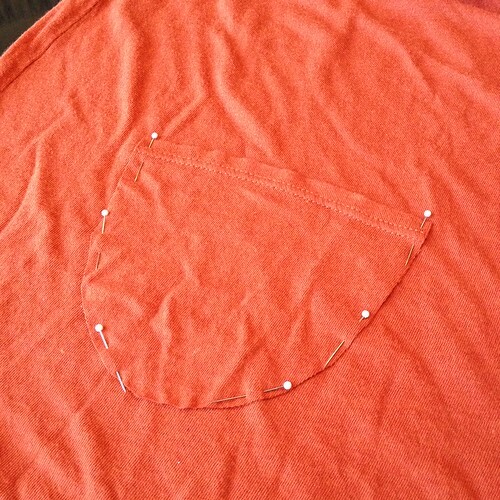 First, I removed the flower thingies (the beads went into my jewelry-making stash, naturally) and surveyed the damage. 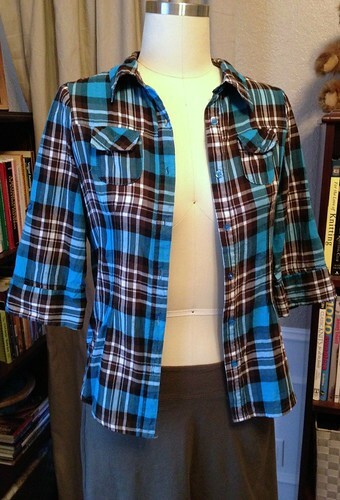 I rummaged through my leftover bits pile and pulled out the unused sleeves from this refashion. 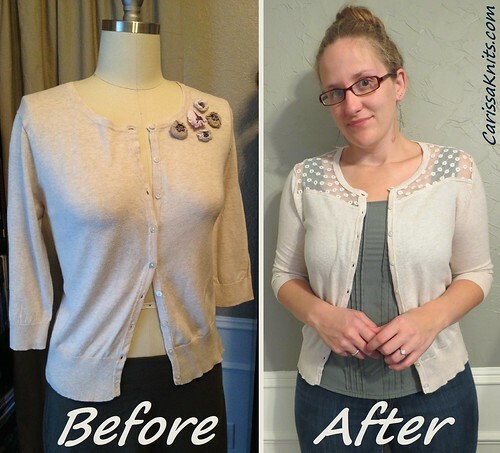 I arranged them on top of the cardigan until I found a position I liked, and then I pinned it in place. 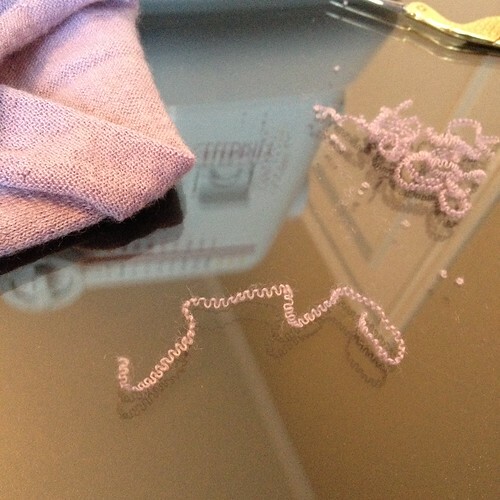 I trimmed away the excess lace. 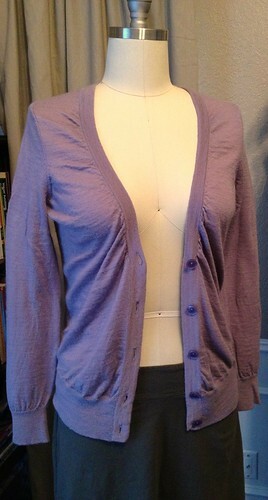 Next I removed the lace and cut away the cardigan underneath. Then the lace got reattached, on the under side this time. A little bit of stitching around the edges, and it was complete. The lace panels are much more my style! Lace insets are one my favorite repair techniques recently. 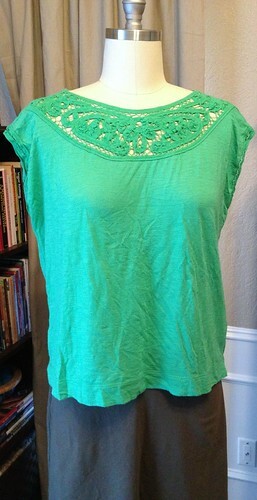 I've been known to buy huge lace dresses at the thrift shops just to beef up my lace stash! Each tweak is interesting ! 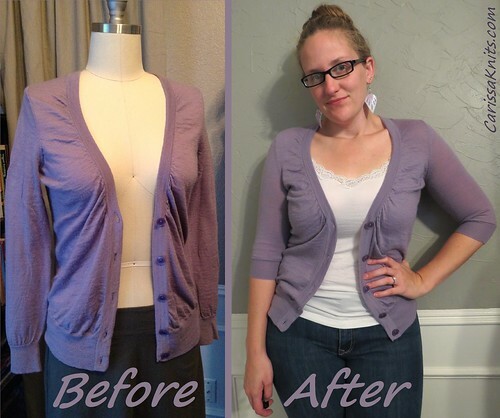 My favorite is the lavender cardigan and what a surprising finish - the 3/4 sleeves creates a much better garment. They really do! 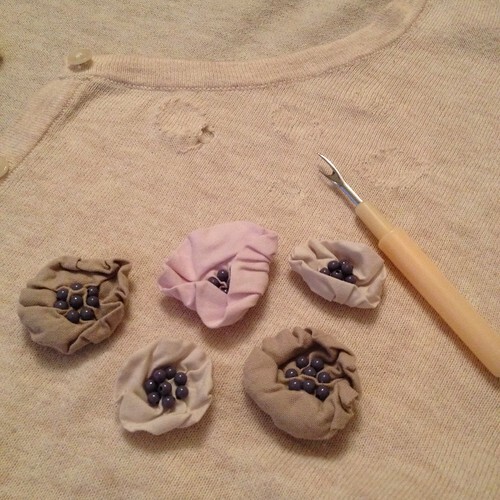 I think the 3/4 sleeves are a little more feminine - the perfect match for the soft lavender color and the light gauzy wool. Love all of these, but particularly the two cardigans. You are a wizard! And you probably already know this, but just in case ... grease stains can often be removed if you work a bit of dish detergent into them and leave for 10-15 minutes before laundering. 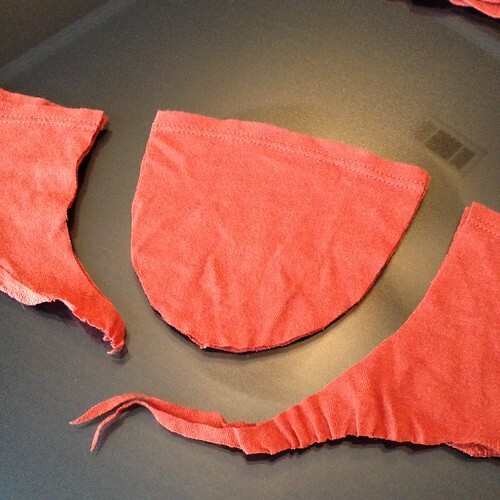 It generally even works on pieces that have been through the dryer. But I must say, I like the sleeveless look on that top better in any case. Thanks for the tip! 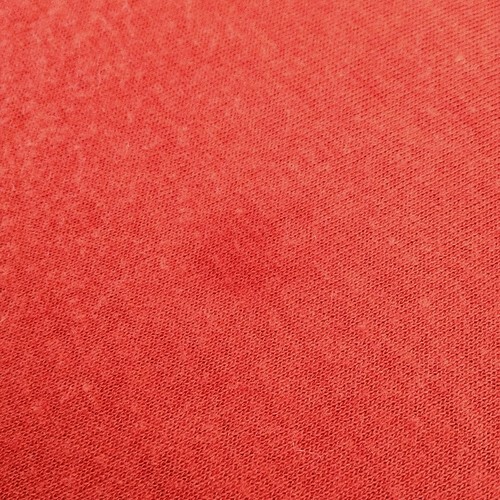 I planned to remove the sleeves anyway, so making a little pocket to cover the stain wasn't that much more work. But I am definitely filing your method for future reference! Hhmmm... I don't have a particular favorite, no, but are you on Ravelry? If not, you should totally sign up! You can search their database - filter for socks, check the "free" box, choose your difficulty level. 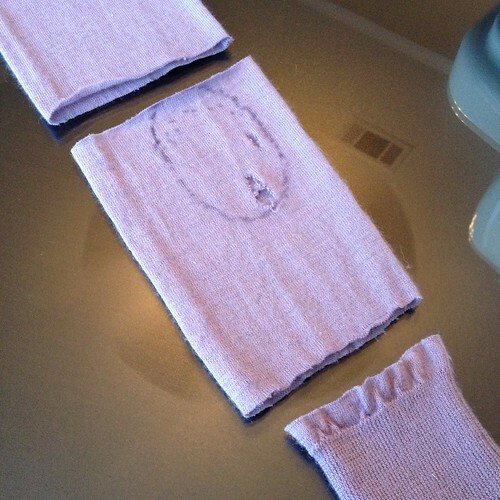 A quick search turned up 266 free, easy sock patterns. If you are on there, you should look me up - my username is "nosmallfeet"
Any ideas on how to keep a fine wool sweater going,it's worn away under both arms. Hmmm... 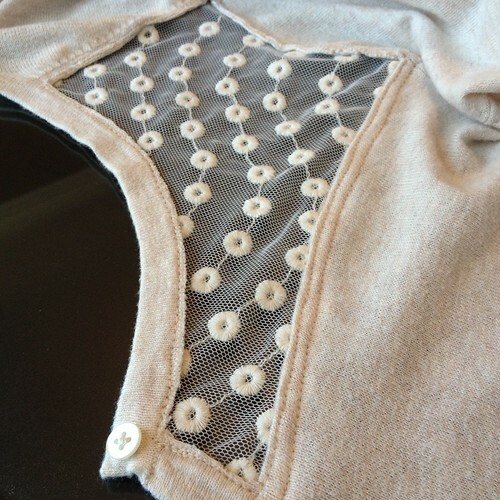 Using a detergent for delicate fabrics can help extend their life, and depilling knits can make them look new again. But I'm afraid, once they start to look thin, it may be too late. 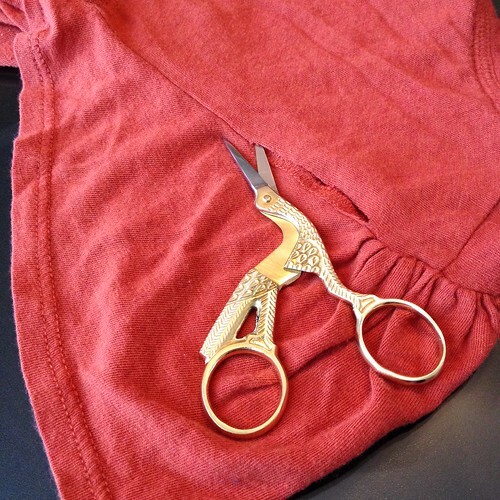 If your sweater is past the point of no return, you may consider cutting off the lower body and making an infinity scarf, and the sleeves could become legwarmers or armwarmers or some such accessory. You have such interesting items in your wardrobe! .....all because you don't mind fiddleing around with them! I love seeing all your little fixes! 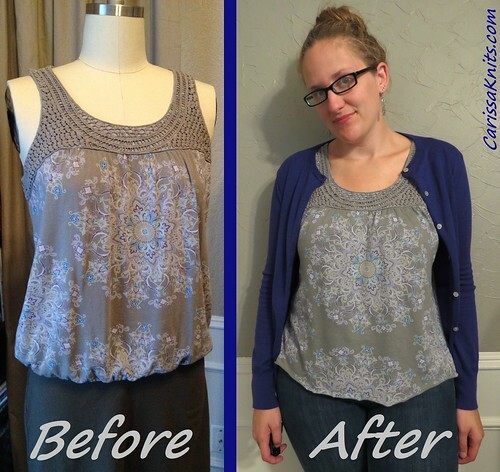 That's one of my favorite parts of refashioning - having totally unique garments!